We’re so excited to launch our newest feature — Workflows, now available in NeonCRM! Check out the step-by-step instructions below, or watch our webinar video to get an overview of what you can do with Workflows. Workflows are automated sequences of actions that replace manual work, data entry, or communications. 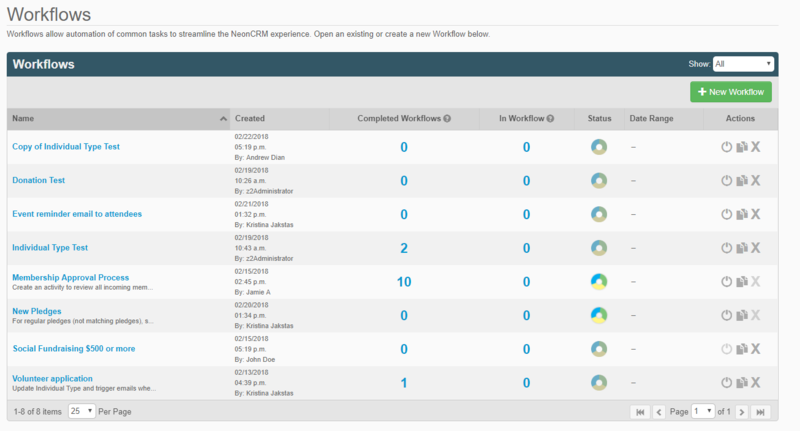 Designed to save you time by automating common tasks, Workflows will streamline your NeonCRM experience. They can remind system users to take action or actually contact your constituents for you! Creating a Workflow in NeonCRM is super easy. You’ll just need to select a trigger, narrow down your target audience, and choose the actions you want to automate. This is where you’ll see your existing Workflows, including status and history of people enrolled. You can also activate, deactivate, clone, or delete an existing Workflow from this screen. To create a new Workflow, hit the green “New Workflow” button at the top right. Choose from an extensive list of triggers to start your Workflow. A “trigger” is an action, date, or specific set of criteria to set the process in motion. There are three categories to choose from: events, dates, or conditional. Event triggers are things that happen in your NeonCRM system. Examples include any kind of transaction, like donations, memberships, event registrations, or pledges. Date triggers are anything that centers around a specific date. This can include personal account dates (like date of a membership expiration or birthday), or more general object dates (like the end of a campaign or start of the fiscal year). Conditional triggers are where you can really get creative. You create a custom search, and any accounts that fit the criteria you specify will be enrolled into the Workflow. That’s more than 20 out-of-the-box triggers you can choose from, plus a nearly endless selection of conditional triggers! But if you don’t see exactly what you need, you’re able to narrow down your target audience and use if/then logic in your workflow to further customize your Workflow. Next, you’re given the option to narrow down your target audience. You can either enroll all accounts that meet your chosen trigger, or you can filter with specific criteria related to your Workflow’s trigger. From there, the Workflow will only target the constituent records that you specify. This added targeting ensures that each Workflow is only engaging the audience you intended. Targeting can also help you customize your engagement. For example, you might not have the capacity to make a personal “thank you” call for every donation — but it might be important to do that for donations over a certain amount. You could create a workflow that targets only donations made over $500, then automatically assigns a follow-up phone call activity to one of your staff. And finally, the Workflow automates a set of actions that you choose. You’ll be able to automatically update data, create activities or notes, send communications, or manage constituents — all based on the actions and logic that you create. You’ll be able to add any combination of up to 15 actions to each workflow. 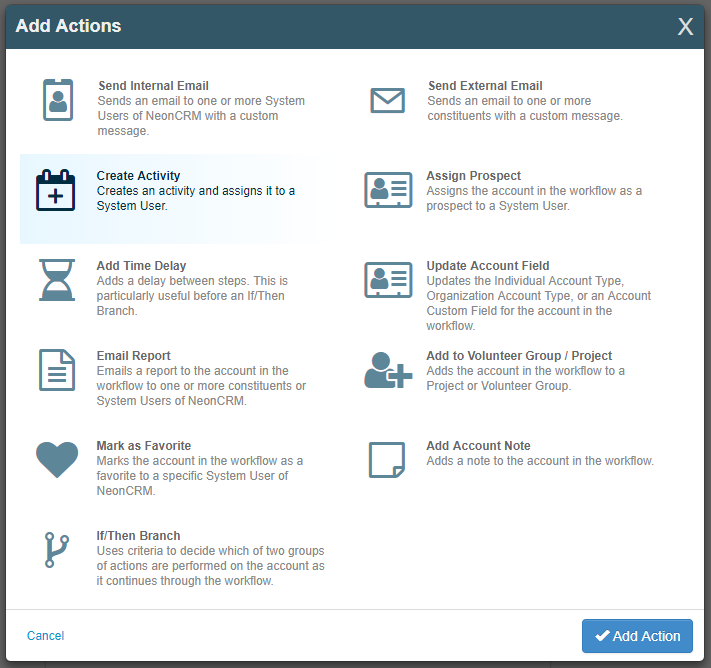 With Workflows, you’re able to add smart if/then logic and branching to further customize your constituent engagement. Remember the “thank you” call example we used earlier? You could use if/then logic within one Workflow to engage large donors and smaller donors. If/then logic allows you to create a certain set of criteria, then split actions into two branches — YES if they meet the criteria, and NO if they don’t. For example, you might enroll donations under $500 into a follow-up email series, but create a “thank you” phone call activity for any donation over $500. This way, you can create a different set of automated engagements for slightly different audiences within one Workflow. It’s designed to give you more control over your engagement — while saving you time! So what happens after you’ve built your Workflow? Once you activate it, the Workflow will start executing actions based on your criteria and targeting. If you need to pause, edit, or delete your Workflow down the line, you can do that on the Workflows homepage. This is one of our biggest new feature releases ever, and we hope you’re as excited as we are! If you have additional questions, feel free to reach out to our Client Success or Nonprofit Sales Consultant teams. For general information on Workflows and pricing, check out our Workflows feature page. For current clients with technical questions about Workflows, visit our Support Center to read guides or submit a support ticket. When I read your article it is really important to fork into my strategies in view to benefit of your favor.